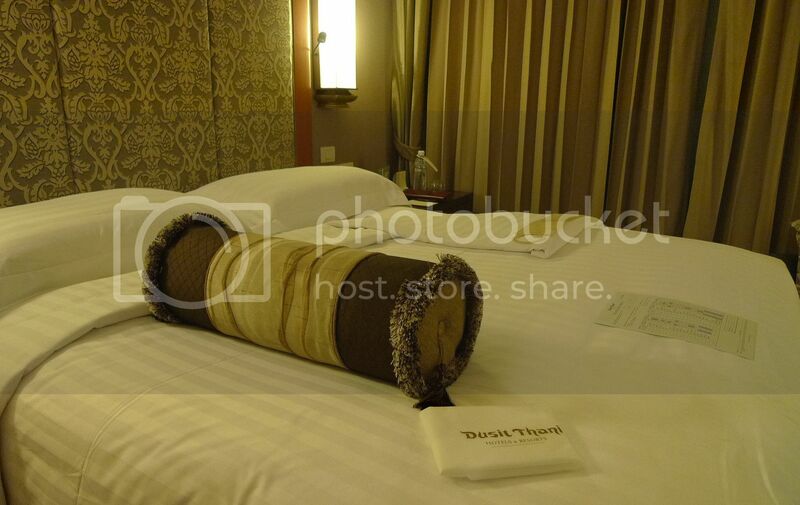 During my recent trip to Bangkok, I stayed at Dusit Thani Hotel, a 5-star luxury hotel located at Rama IV Road. I don't normally stay in 5-star hotels when I travel as I prefer to spend my money on sight-seeing and food. I only need the hotel to sleep at night. But it was different this time as the hotel room was paid for. 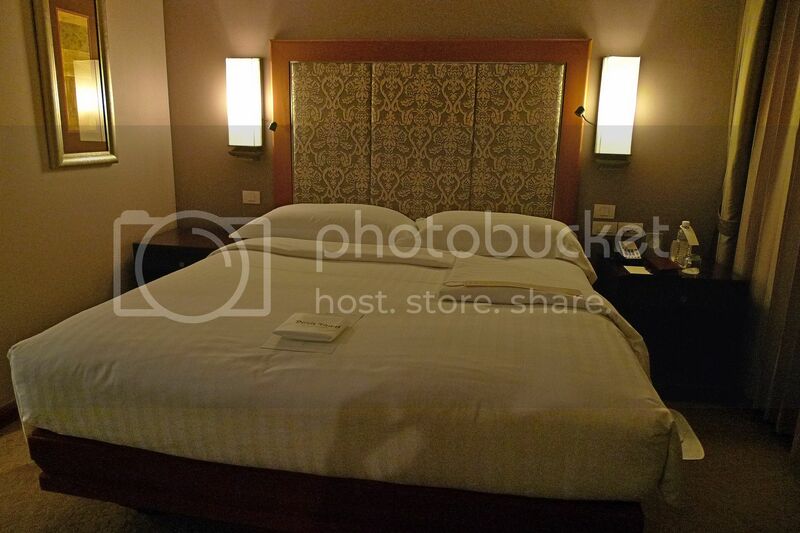 My friend and I stayed in the Dusit Grand Twin room, which comprises a work/lounge room, a bedroom and a very spacious and luxurious bathroom. This is the bedroom which I slept in. My friend slept in the lounge room, which also has a double bed. There is a TV in each room. Look! From inside my room, I could actually watch two TVs at the same time. Haha!! Oops! I am showing my legs again! LOL! The TV in the lounge room in the photo above is actually a reflection on a mirror behind the bed where my friend would be sleeping on. 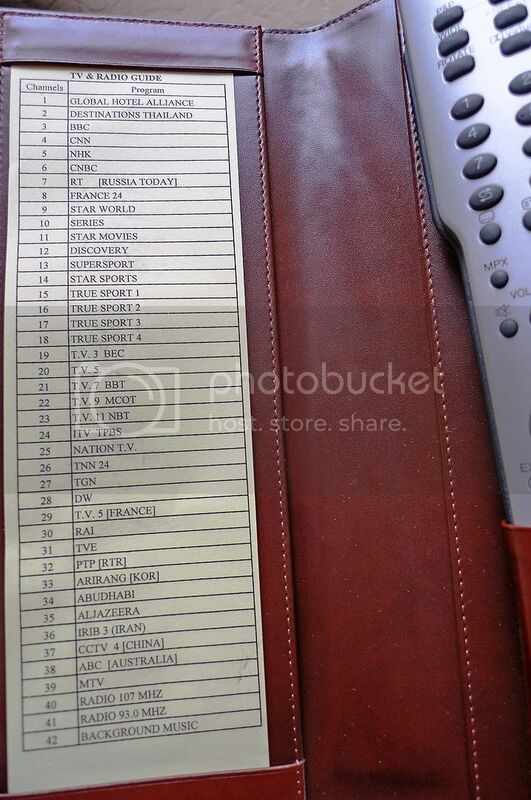 The were 42 channels for me to choose from as shown by the TV guide in the photo below. I found this Christian Bible in the drawer. Luckily the Bible was not opened up on the table if you know what I mean. Haha! There's also a Buddhist religious book in the drawer. 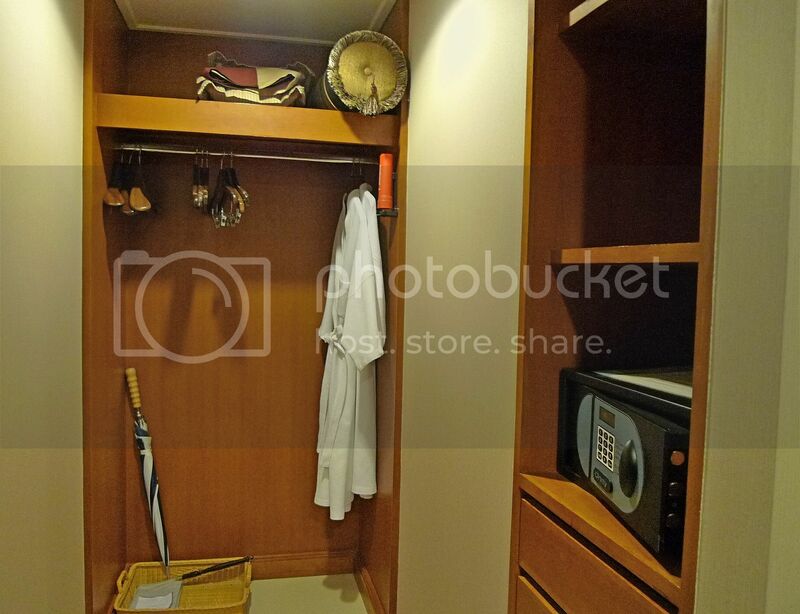 The hotel also provides bathrobes, hangers, umbrella, slippers and a private safe. Nice! Oh did you notice that round bolster at the top? Well, I took the big bolster and put it on my bed for my own use! Haha! 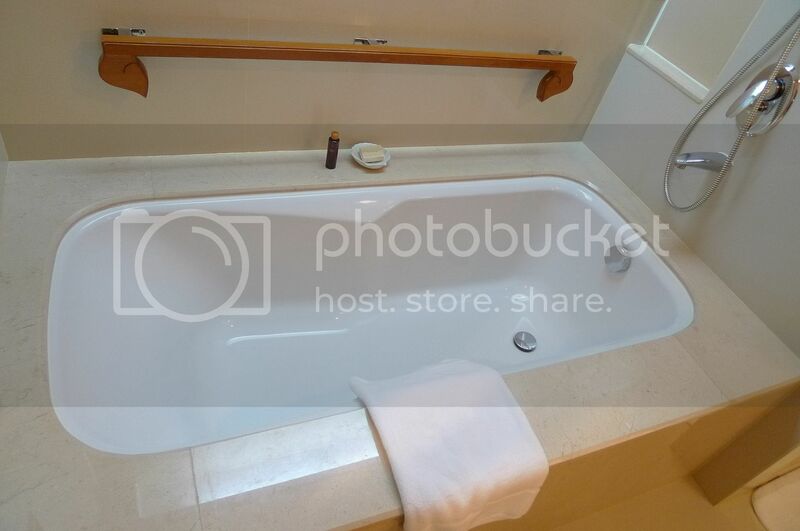 There's a bathtub, though I didn't make use of it! 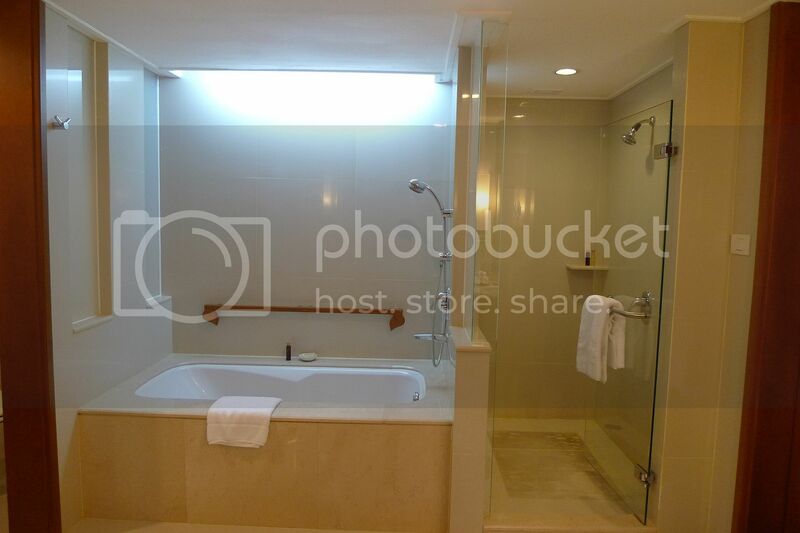 And there's a cubicle for shower next to the bathtub. The toilet was not bad. 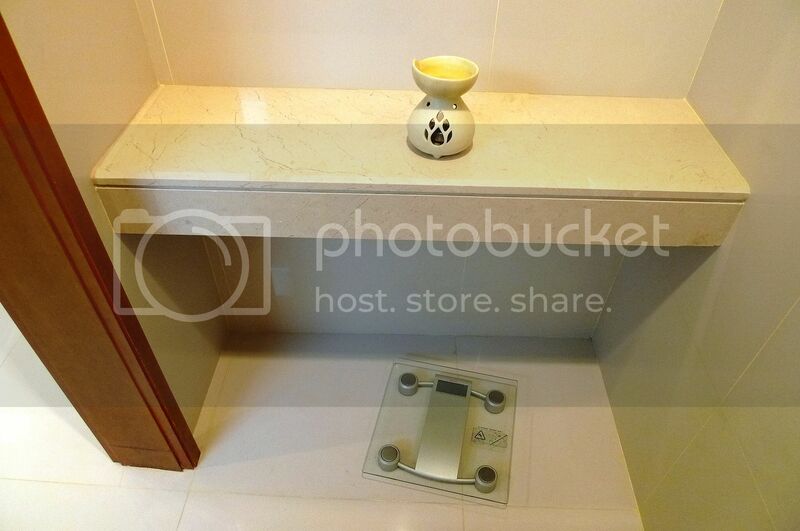 There's even a burner to freshen the air and also the weighing machine which I stepped on every day just for fun! Before I went to Bangkok, my weight was 63kg. 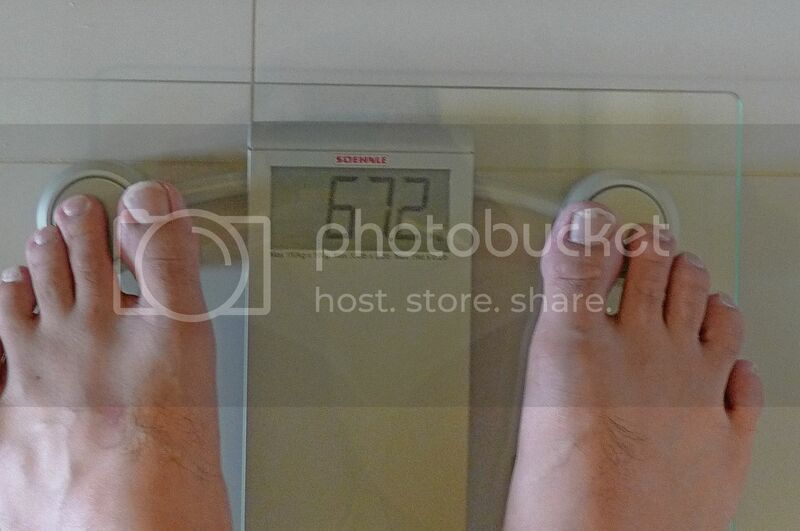 On the third day in Bangkok, I weighed myself and was shocked to see the readings! 67.2kg? Oh no!!! Must be all the good food I ate in Bangkok!! The bathroom had all the amenities I wanted. Shaver, hair dryer, comb, toothbrush, hand soaps, sewing kit and ample towels! Oh by the way, I love their bath and shower gel. 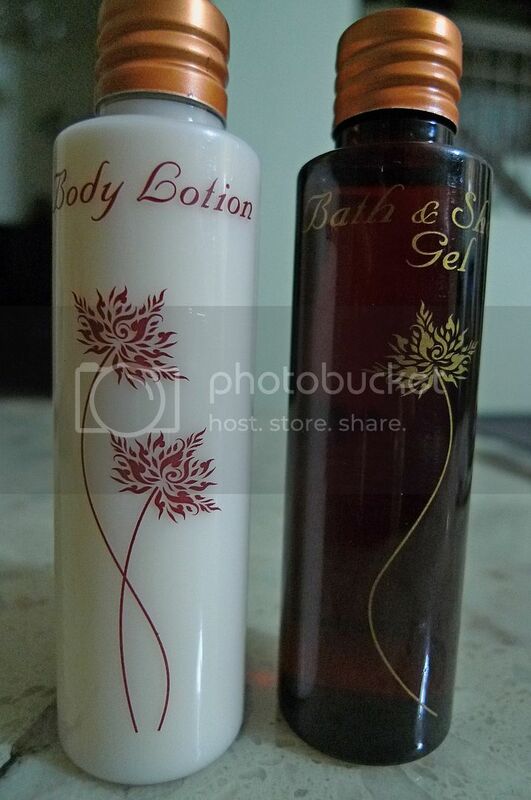 I think the body lotion should be good too, though I did not bother to use it. 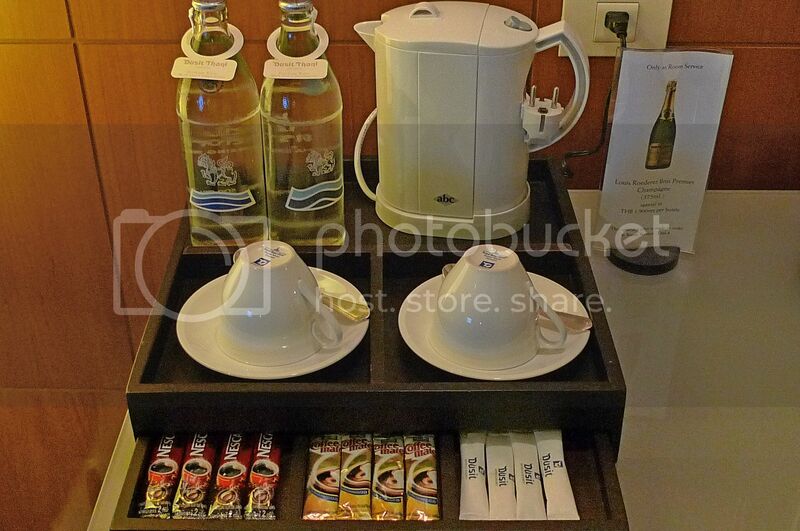 The Dusit Grand Twin room also came with coffee and tea making facilities and also a mini bar. 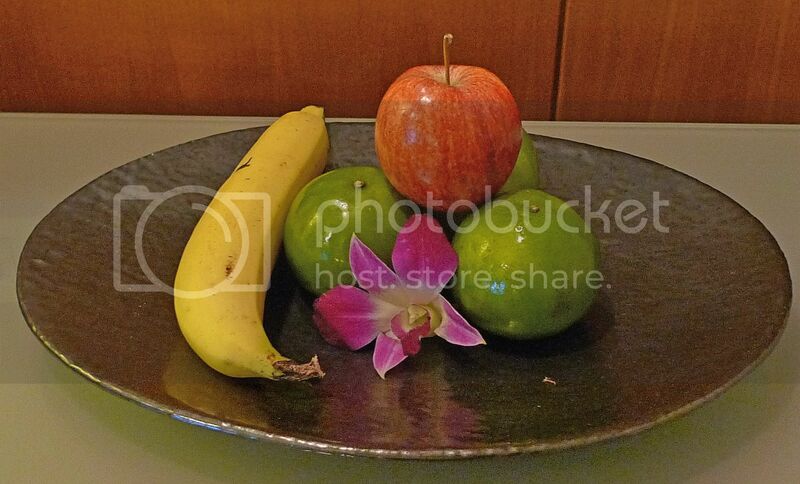 We also had a nice plate of fresh fruits which was replenished every day. OK, there's supposed to be two pieces of bananas here - I ate one before I took the photo. Haha! 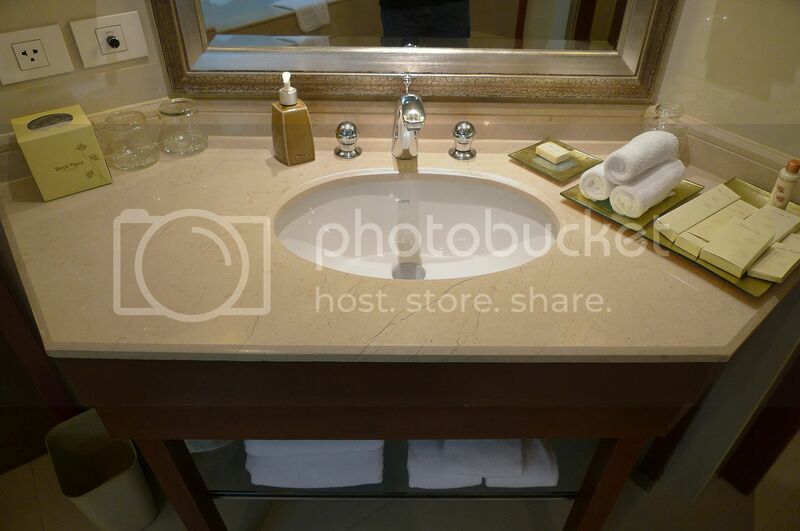 I enjoyed staying at Dusit Thani. The staffs were warm and friendly. Since I was staying here for free, I did not bother too much about the room rates until I saw this. What?! 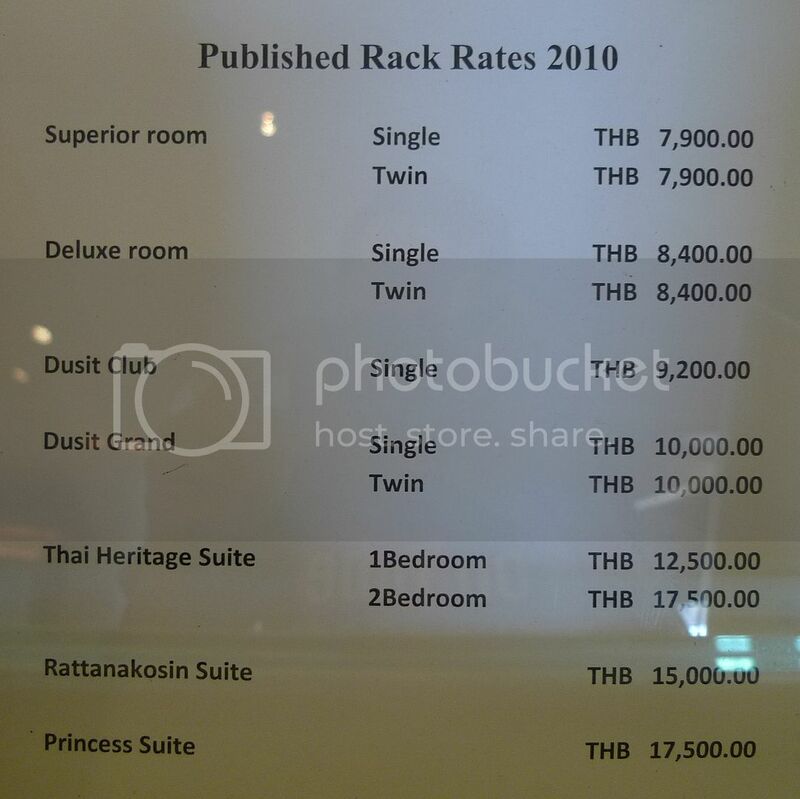 The Dusit Grand costs 10,000 baht (about RM1,000) a night? I was quite shocked. I doubt if I will ever pay to stay in this hotel unless I am a millionaire or something. LOL! 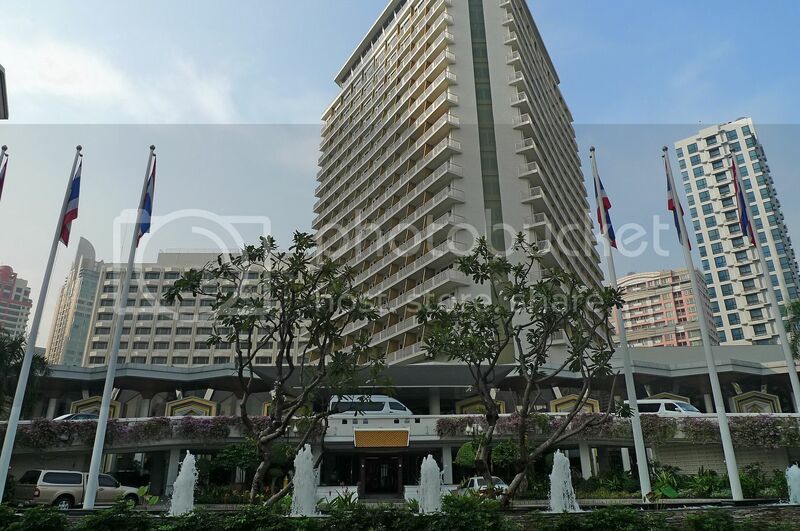 More about Dusit Thani Hotel coming up in my next post, so stay tuned! Wow....5 star? Must be quite expensive? :p The hotel was paid for? So good? Hahaha :D So you can watch 2 different programs lar! 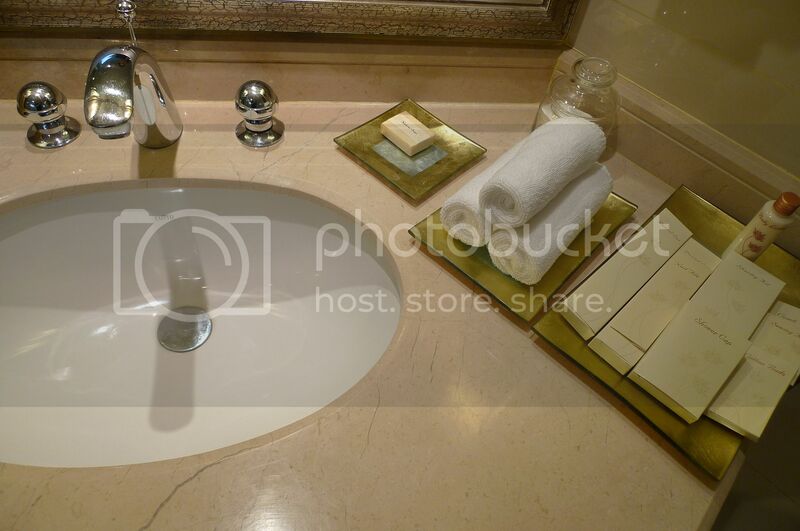 Wow...what a spacious bathroom. Why you did not use the bath tub? Can soak yourself mah. Do you have picture of the Buddhist book? But then, Thais are predominantly Buddhists, so why not? Nice pictures esp the first one - postcard perfect! Thanks for the tour, Foong. A copy of the Bible used to be available in our hotels here but not anymore, I think, though it's still available in hotels in Sgp. Yeah, show us the picture of the Buddhist scripture, if you have taken a shot of it, Foong. Those rates are normal for 5-star hotels. These rack rates are what our 5-star hotels charge too. That's why it's always good to prebook a room with a corporate rate though corp rates do vary from company to company. Internet rates are good too. But of course, free stay is the best! ohmy! so heavy! lol! anyway, eric is 72, means u r still ok *i guess* LMAO!! and i like the idea of giving the room guests a bolster to cudddle! hehe..
Uhh... pardon me for my ignorance, but what does Bible opened up on the table mean? Woo I love the toilet too. Wah got bolster in hotel? First time I see this! must be very expensive yikes..
wah, so nice!! how come you have free hotel stay in Bangkok?? somemore a 5-star hotel..
really crazy price also, i don't think i can even afford to stay at their cheapest room..
Ha ha how come didn't use the bathtub?? If me, for sure swim2 every day one hahahah! This hotel is huge.. and I'm glad u got a chance to lepak here! 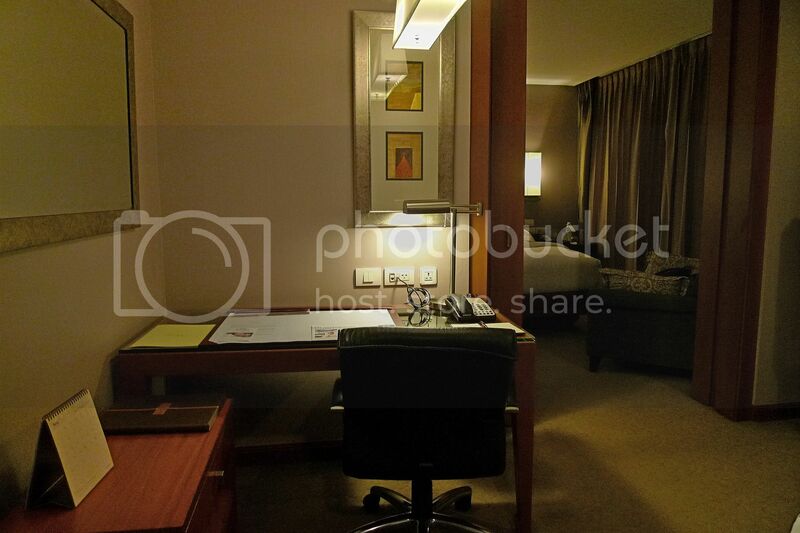 the hotel room does look fantabulous and very inviting. glad you enjoyed your stay at the hotel. Nice hotel and even more nice to stay foc haha..tQ to Happysurfer for the tips on going about the usual sky high rack rates. Erhhh showing your legs again lol..
Wow! Tell me how you got to stay FREE???????? That hotel was a royalty hotel like 20 years ago. The price is published rates but anyone could get discounted rates at RM500 onwards. Many Bangkok 5 star hotels are the cheapest in the world. 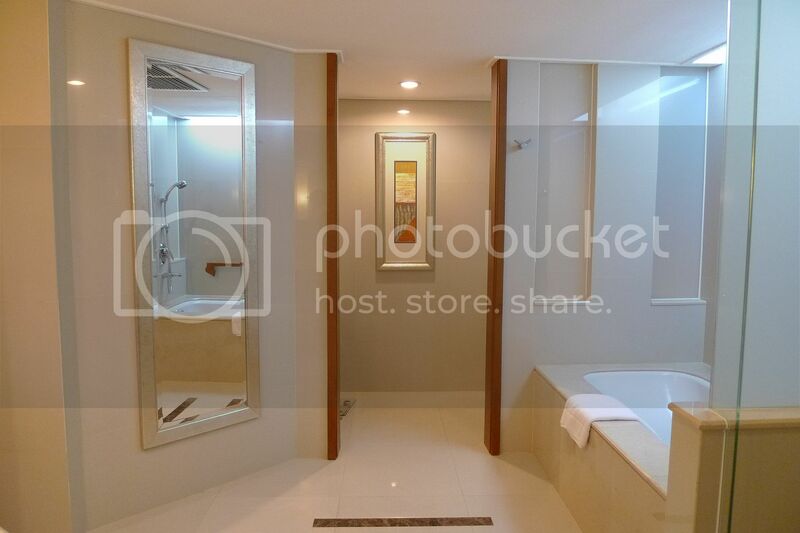 I used to stay at Emporium Suite along Sukhumvit Road which is only RM300+ per night for 5 star standard. The feet on the scale must be yours! Look at your long toe nails!!! OMG! I am glad you enjoyed the facilities inside the room. I noticed that our local 5 star hotels in Malaysia often cannot match the ones in Bangkok. You agree? 2010 is coming to an end! Are you going to send me my prize in 2011???? LMAO! hehehe your foot toe is look long... u seldom cut it? I'm 5 feet 6 inches, so I think 67kg is slightly overweight. The room costs RM1,000 per night according to the published rack rates but of course you can get it cheaper if follow corporate rates. khengsiong, no I did not take a photo of the Buddhist book unfortunately. Yes, this is a Buddhist country, so that's why they have Buddhist religious book in the hotel room besides the Bible. Yes, the room is pretty expensive and I also will think twice if I have to pay for it. happysurfer, glad you like the pictures! Unfortunately I did not take pictures of the Buddhist scripture. 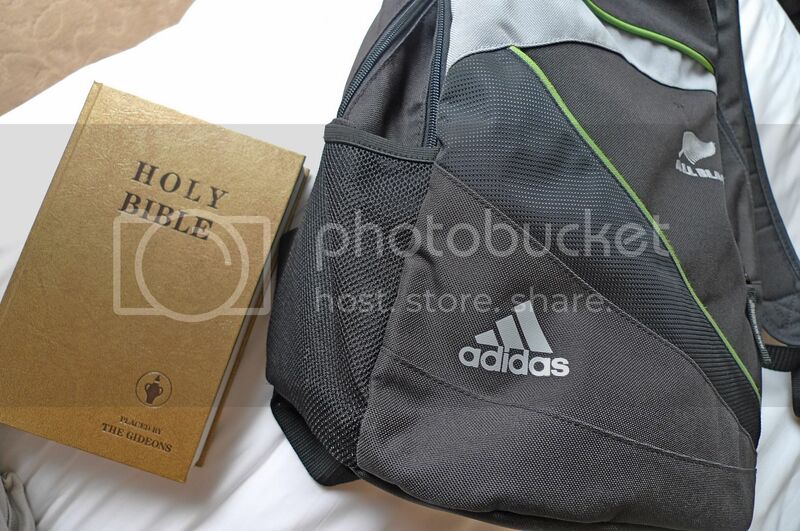 How come no more Bible in our local hotels? caroline ng, haha! I don't really like bubble bath. 72kg very heavy meh? Slightly overweight I admit but definitely not on the heavy side yet, haha! iamthewitch, yes I love the double beds and also the huge and white bathroom LOL! kyh, Haha! I won a contest and that's how I get to stay for free! Oh, the bolster is really a luxury! Haha! bengbeng, I am not loaded! I can't afford that RM1000 a night hotel! Yeah, it's really big and luxury and expensive of course. No I will not do that for the next post haha! bananaz, yup, showing my legs again! Haha! twilight, Why I stay for free? Cos I won a contest! Haha! Discounted rates at RM500 is still too expensive for me! LOL! I don't stay a lot in our local 5-star hotels so I cannot compare with the ones in Bangkok. Your prize is already on the way. Hope you are around to receive it! That's a nice room,good stuffs that came with it too! that spacious bathroom is a pleaser! Nice hotel. How bout the location? It is convenience?